The OWA annual membership fee is $50. It provides participation in club activities from September of one year to August of the next. Non-members may attend one or two meetings -- ask for a guest pass -- before deciding whether to become members. Paying dues can be done using PayPal at this web page or in person at meetings. It is important that renewals be done at the beginning of an OWA year, around September, so that the Membership Secretary can distinguish continuing members from those who have left the club. 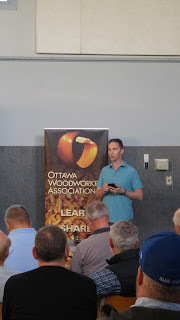 If you are new member joining us late in the OWA season, from January through June, then you are entitled to a rebated membership depending on how much of the year has passed. This does not apply to late renewals, only to those joining the OWA for the first time. Instead of using PayPal here, pay Jeff Gleeson, the Club Secretary, or Roger Chan, Treasurer, with cash or a cheque at the next meeting. Full-time students may join the OWA at a reduced annual fee of $25. Students who join or renew through PayPal should present their student cards to the club secretary at the next meeting they attend. I am... renewing OWA for another year. joining the OWA for the first time.